Hi-Touch Imaging Technologies is demonstrating its new large format printer. This new printer will be targeting more home use end-users as well as professional event photographers. Hi-Touch has aggressively introduced their cost per 4"x6" print at a competitive 40¢ per print. A 50-Photopaper pack comes with a ribbon cartridge and 50 sheets of photo paper good for 50 prints carrying a retail price of $20. This compares favourably with other dye-sublimation brands whose costs per print are in the 55-85¢ range. The HiTi 730PS features impressive maximum 6"X8" borderless prints, which is the upgrade of the original outstanding stand-alone HiTi 630PS. HiTi's 730PL delivers 300dpi resolution, thermal-transfer, true-color, continuous tone and color-depth printing technology to intensify the perfection of the images. 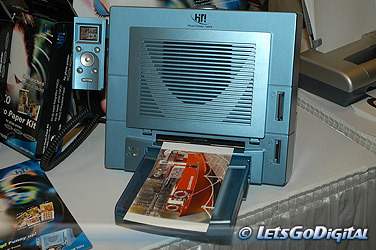 The machine will print 6"x8" photos in approximately 70 seconds, the 5" x 7" approx. 60 seconds, and the 4"x6" approx. 40 seconds. The machines will use variable media which can be interchanged. This photo printer is expected to be the most economical consumable on the market which will result in significant cost savings for end-users and professional photographers. The HiTi 730PL is in final development and will be available in March, 2004. Featuring 4x6, 5x7 and 6x8 inch borderless prints, HiTi Photo Printer 730PS delivers superior photos through its Dye Sublimation technology at 300 dpi of continuous tone printing capable of 16.77 million colours. 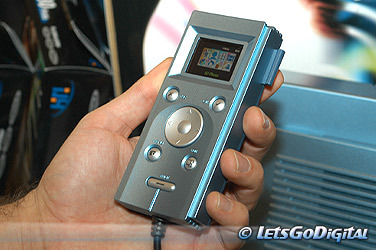 Equipped with a color LCD handheld controller and two memory card slots that accept CompactFlash, SmartMedia, Secure Digital (SD), Multimedia Card (MMC), Memory Stick, Memory Stick Pro and IBM Microdrive. Prints can be done without a computer in approximately 70, 60 and 40 seconds for a 6"x8", 5"x7" and 4"x6" borderless photos respectively. The machine will use three interchangeable media for different sizes. This is expected to be the most economical consumable for its size on the market and result in significant cost savings for users. The availability of the latest 730PS is scheduled in March, 2004.